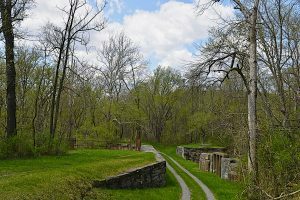 The Sideling Hill Creek Aqueduct was built between 1837 and 1840 primarily using Tonoloway Limestone from the quarry at the mouth of the Cacapon River, as well as Pocono sandstone rubble from Sideling Hill. The cement that binds it all together came from Round Top Mill and Leopards Mill. The aqueduct has a single arch with a 70-foot span. The creek marks the boundary between Washington and Allegany Counties.